In October our quilt guild had a program on using old denim blue jeans to make Christmas stockings. They were so cute and looked easy to make so I decided to make them for our whole family and hang them on our fireplace this Christmas. This first one is the one I made for John...guess it was the prototype for all the rest. 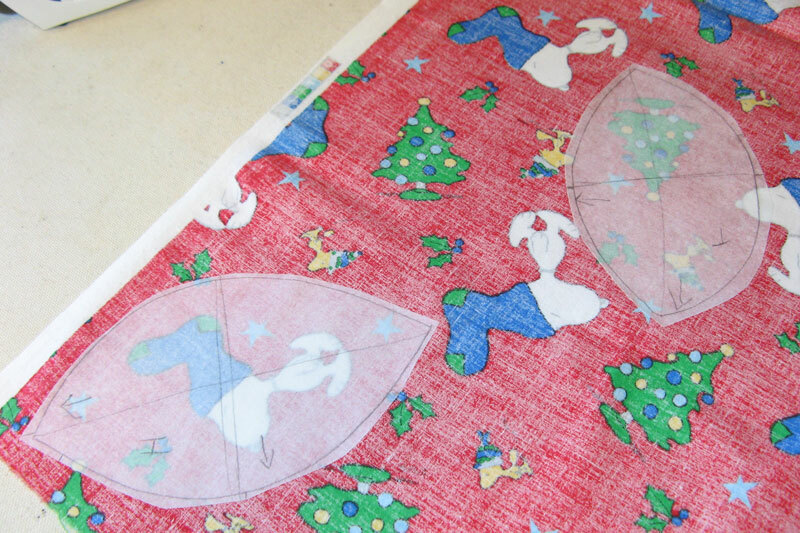 I didn't use the pattern that we were given as I wanted my stockings a little larger so I just drew it a little larger. 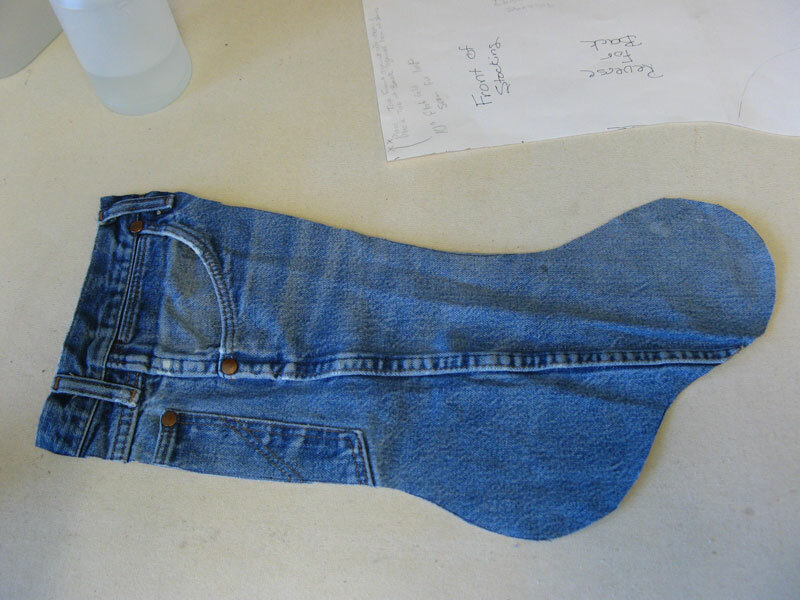 We have lots of worn out denim blue jeans so had the fabric needed for the base of the stockings. This post will be the first part of tutorial on how I made them, the next part two on how to make the stocking and then follow up posts will be some of the tips and tricks I learned as I was making them. 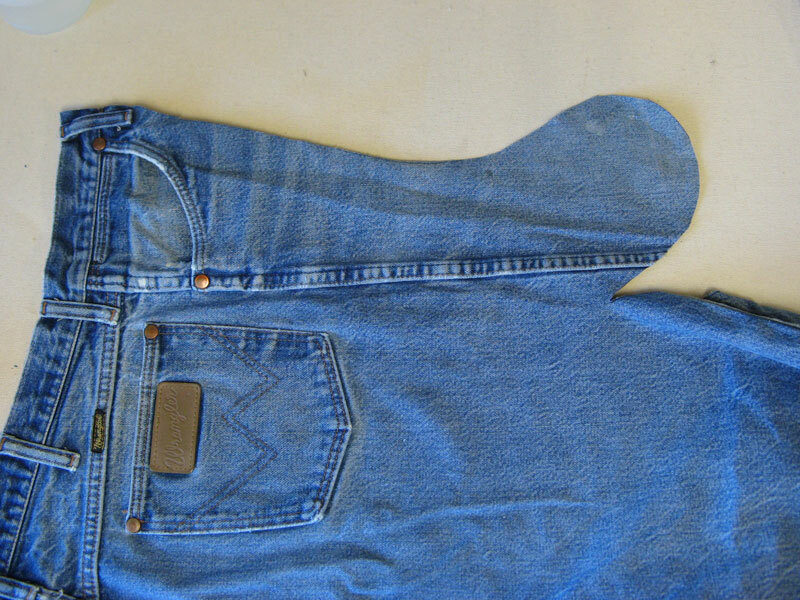 The front side of the stocking is cut from the top of the jeans using the waistband for the very top. I varied where I placed my pattern to make all the stockings look different. I laid the pattern on one side of the jeans where I thought it would work the best. Since the jeans are not flat pieces of fabric I flipped the jeans over to make sure the pattern would fit as shown in the photo below. Trace around the pattern on the one side of the blue jeans and cut that first part out so you can open it up and lay it flat to finish the tracing and cutting. Here is one stocking front base...next is to decorate it. The toe and heel patterns I traced on a fusible paper backed web and fused to the selected fabric. 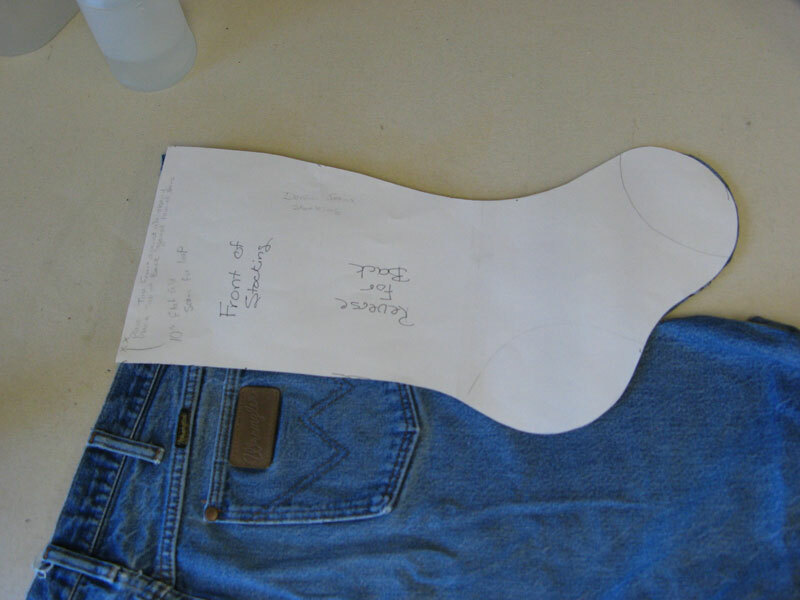 As you can see from the photo below I selected certain spots for the toe and heel from this particular fabric. 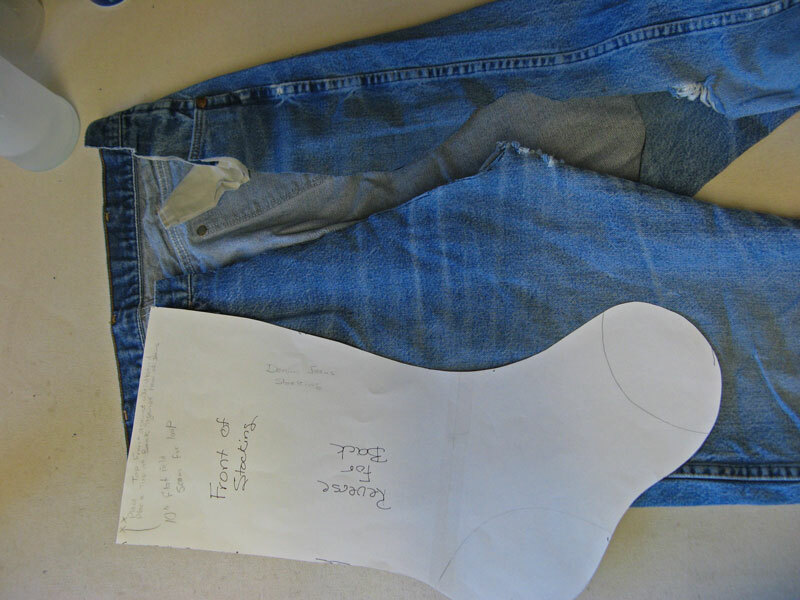 Cut out the shapes and peel the backing off and fuse to the toe and heel of the denim base. I stitched on the inside of each fused shape with a buttonhole stitch on my sewing machine. 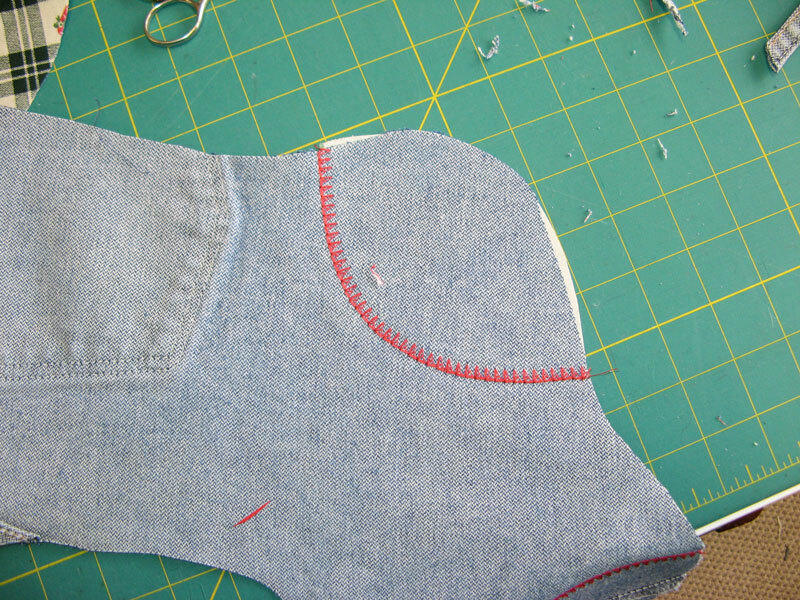 I did flip it over and trimmed the edges of the fused fabric even with the denim. Well that is all for this post...next one will be part 2. Update: Here are the links to all the stocking blog posts. Very cute. Are you having a Western themed Christmas this year? Oh Lynn - that blue jean stocking is brilliant!!! What a clever idea! Can't wait to see the next post. Have a great Sunday afternoon! I'm creating a short cut to come back and hear the rest of the directions and tips. My grandson is in need of a new stocking now that he is nearly two...the babyish one I made him his first Chirstmas can be handed down to baby brother. His name is Levi, so I will be looking for a pair of Levi's to make his! Thanks for this great idea! That idea is just too cute. I want to try it--but I just gave away all my old jeans since I moved. Ack! I'm bookmarking this for future reference. What a super cute idea! These would be great for a farm/ranch family Christmas. I've just popped over from Sew Many Ways - and am so glad I did! Thank you SO much for the tutorial - this denim stocking is the cutest I've ever seen!!! das ist einfach nur schick. This is great. It is a wonderful way to memorialize a loved one by using fabric once worn by them. Thank you for sharing your tips and tricks as well as the original directions. VERY BEAUTIFUL. SAVE THE STEP BY STEP AND I WILL DO. ADD YOUR BLOG TO FAVORITES. KISSES. I love these...do you have a template for the stocking? Hi Lynn! My name is Melissa and I'm the editor for FaveCrafts.com. What an adorable stocking! I'd love to publish this craft on FaveCrafts. I think our readers would love it! You can email me at mconner@primecp.com for more info. Thanks for your post....I went to FaveCrafts.com and signed up! Fabulous site! My hall bathroom is decorated in bluejeans. So I am going to make one of these to hang on the door. I love it alot!! Thanks for sharing! Super cool idea. 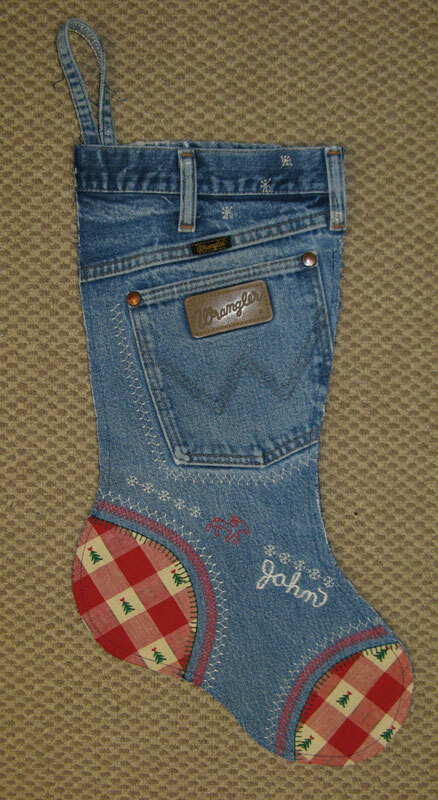 I recently ran across your jeans stocking. I am going to make one (I hope in a couple of days) I got the sock cut out today. Thank you for a terrific idea. I have to find a different product than my heat and bond super as this would not sew through on the sewing machine. Will need to wait now until tommow or Friday. Did I read you did not do seams just did a 1/4 stitching up the sides? Rather then placing right sides together and stitching. Love your denim stockings!!! 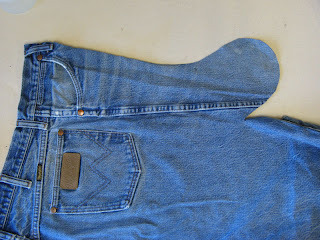 A great way to reuse pre-loved jeans. So cute! I don't have any old jeans in the house but I now have the sudden urge to go to goodwill and buy some. Love the red toe and foot! Monkeyneedle - you are a no reply blogger so can't reply to you personally through email. I am going to hang the ones I made for my family tomorrow and am looking forward to filling them too! Have fun if you to find some jeans. Where can I get the template for the stocking? That is so cool and is really amazing too. I would have never thought of making a Christmas stocking out of an old pair of jeans. I mean you could even do this for a baby Christmas stocking too. That would be so cute and would just be so perfect. We are a cowboy boot family. Need to design one of these in the shape of a cowboy boot. That would be so cool. Use the guys or little kids old Wrangler to do it.